In the American police state, you’re either a prisoner (shackled, controlled, monitored, ordered about, limited in what you can do and say, your life not your own) or a prison bureaucrat (police officer, judge, jailer, spy, profiteer, etc.). Indeed, at a time when we are all viewed as suspects, there are so many ways in which a person can be branded a criminal for violating any number of laws, regulations or policies. Even if you haven’t knowingly violated any laws, there is still a myriad of ways in which you can run afoul of the police state and end up on the wrong side of a jail cell. Unfortunately, when you’re a child in the American police state, life is that much worse. From the moment a child enters one of the nation’s 98,000 public schools to the moment she graduates, she will be exposed to a steady diet of draconian zero tolerance policies that criminalize childish behavior, overreaching anti-bullying statutes that criminalize speech, school resource officers (police) tasked with disciplining and/or arresting so-called “disorderly” students, standardized testing that emphasizes rote answers over critical thinking, politically correct mindsets that teach young people to censor themselves and those around them, and extensive biometric and surveillance systems that, coupled with the rest, acclimate young people to a world in which they have no freedom of thought, speech or movement. If your child is fortunate enough to survive his encounter with the public schools, you should count yourself fortunate. Most students are not so lucky. By the time the average young person in America finishes their public school education, nearly one out of every three of them will have been arrested. More than 3 million students are suspended or expelled from schools every year, often for minor misbehavior, such as “disruptive behavior” or “insubordination.” Black students are three times more likely than white students to face suspension and expulsion. For instance, a Virginia sixth grader, the son of two school teachers and a member of the school’s gifted program, was suspended for a year after school officials found a leaf (likely a maple leaf) in his backpack that they suspected was marijuana. Despite the fact that the leaf in question was not marijuana (a fact that officials knew almost immediately), the 11-year-old was still kicked out of school, charged with marijuana possession in juvenile court, enrolled in an alternative school away from his friends, subjected to twice-daily searches for drugs, and forced to be evaluated for substance abuse problems. Many state laws require that schools notify law enforcement whenever a student is found with an “imitation controlled substance,” basically anything that look likes a drug but isn’t actually illegal. As a result, students have been suspended for bringing to school household spices such as oregano, breath mints, birth control pills and powdered sugar. It’s not just look-alike drugs that can get a student in trouble under school zero tolerance policies. Look-alike weapons (toy guns—even Lego-sized ones, hand-drawn pictures of guns, pencils twirled in a “threatening” manner, imaginary bows and arrows, even fingers positioned like guns) can also land a student in detention. Acts of kindness, concern or basic manners can also result in suspensions. One 13-year-old was given detention for exposing the school to “liability” by sharing his lunch with a hungry friend. A third grader was suspended for shaving her head in sympathy for a friend who had lost her hair to chemotherapy. And then there was the high school senior who wassuspended for saying “bless you” after a fellow classmate sneezed. Unfortunately, while these may appear to be isolated incidents, they are indicative of a nationwide phenomenon in which children are treated like suspects and criminals, especially within the public schools. The schools have become a microcosm of the American police state, right down to the host of surveillance technologies, including video cameras, finger and palm scanners, iris scanners, as well as RFID and GPS tracking devices, employed to keep constant watch over their student bodies. Making matters worse are the police. Students accused of being disorderly or noncompliant have a difficult enough time navigating the bureaucracy of school boards, but when you bring the police into the picture, after-school detention and visits to the principal’s office are transformed into punishments such as misdemeanor tickets, juvenile court, handcuffs, tasers and even prison terms. Thanks to a combination of media hype, political pandering and financial incentives, the use of armed police officers to patrol school hallways has risen dramatically in the years since the Columbine school shooting (nearly 20,000 by 2003). Funded by the U.S. Department of Justice, these school resource officers (SROs) have become de facto wardens in the elementary, middle and high schools, doling out their own brand of justice to the so-called “criminals” in their midst with the help of tasers, pepperspray, batons and brute force. One SRO is accused of punching a 13-year-old student in the face for cutting the cafeteria line. That same cop put another student in a chokehold a week later, allegedly knocking the student unconscious and causing a brain injury. In Pennsylvania, a student was tased after ignoring an order to put his cell phone away. Defending the use of handcuffs and pepper spray to subdue students, one Alabama police department reasoned that if they can employ such tactics on young people away from school, they should also be permitted to do so on campus. Now advocates for such harsh police tactics and weaponry will tell you that school safety should be our first priority lest we find ourselves with another Sandy Hook. What they will not tell you is that such shootings are rare. As one congressional report found, the schools are, generally speaking, safe places for children. In their zeal to crack down on guns and lock down the schools, these cheerleaders for police state tactics in the schools might also fail to mention the lucrative, multi-million dollar deals being cut with military contractors such as Taser International to equip these school cops with tasers, tanks, rifles and $100,000 shooting detection systems. Indeed, the transformation of hometown police departments into extensions of the military has been mirrored in the public schools, where school police have been gifted with high-powered M16 rifles, MRAP armored vehicles, grenade launchers, and other military gear. One Texas school district even boasts its own 12-member SWAT team. 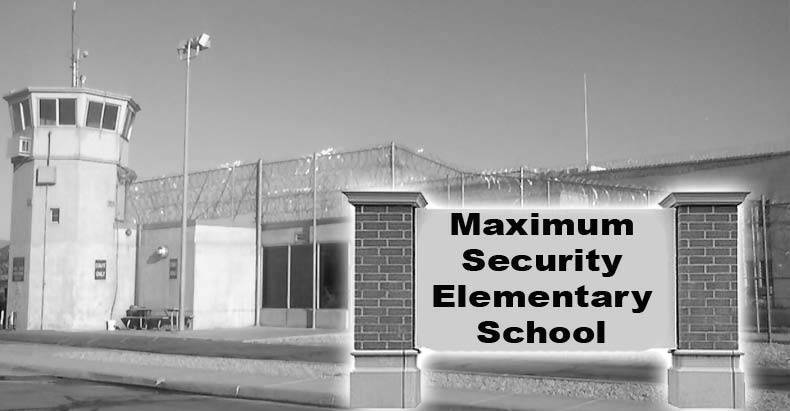 As if it weren’t bad enough that the nation’s schools have come to resemble prisons, the government is also contracting with private prisons to lock up our young people for behavior that once would have merited a stern lecture. Nearly 40 percent of those young people who are arrested will serve time in a private prison, where the emphasis is on making profits for large megacorporations above all else. This profit-driven system of incarceration has also given rise to a growth in juvenile prisons and financial incentives for jailing young people. Indeed, young people have become easy targets for the private prison industry, which profits from criminalizing childish behavior and jailing young people. For instance, two Pennsylvania judges made headlines when it was revealed that they had been conspiring with two businessmen in a $2.6 million “kids for cash” scandal that resulted inmore than 2500 children being found guilty and jailed in for-profit private prisons. It has been said that America’s schools are the training ground for future generations. Instead of raising up a generation of freedom fighters, however, we seem to be busy churning out newly minted citizens of the American police state who are being taught the hard way what it means to comply, fear and march in lockstep with the government’s dictates. As I point out in my book Battlefield America: The War on the American People, with every school police raid and overzealous punishment that is carried out in the name of school safety, the lesson being imparted is that Americans—especially young people—have no rights at all against the state or the police. In other words, John Paul Jones, one of the city’s most dangerous schools, was a perfect example of the school-to-prison, police state apparatus at work among the nation’s youngest and most impressionable citizens. When management of John Paul Jones was taken over by a charter school that opted to de-escalate the police state presence, stripping away the metal detectors and barred windows, local police protested. In fact, they showed up wearing Kevlar vests. Nevertheless, school officials remained determined to do away with institutional control and surveillance, as well as aggressive security guards, and focus on noncoercive, nonviolent conflict resolution with an emphasis on student empowerment, relationship building and anger management. The lesson for the rest of us is this: you not only get what you pay for, but you reap what you sow. If you want a nation of criminals, treat the citizenry like criminals. But if you want to raise up a generation of freedom fighters, who will actually operate with justice, fairness, accountability and equality towards each other and their government, then run the schools like freedom forums. Remove the metal detectors and surveillance cameras, re-assign the cops elsewhere, and start treating our nation’s young people like citizens of a republic and not inmates in a police state.